Ultimate Nutrition Muscle Juice Revolution 2600 is an advanced weight gainer, which supplies eight vital proteins necessary for exercising efficiently and is highly beneficial for serious bodybuilders. It is developed with an improved formula to create Karbo-Lyn, which helps in the thorough utilisation of nutrients. This dietary supplement is integrated with calcium, vitamins, minerals, carbohydrates, glutamine, fish oil, omega 3, whey isolate, whey protein and BCAAs. 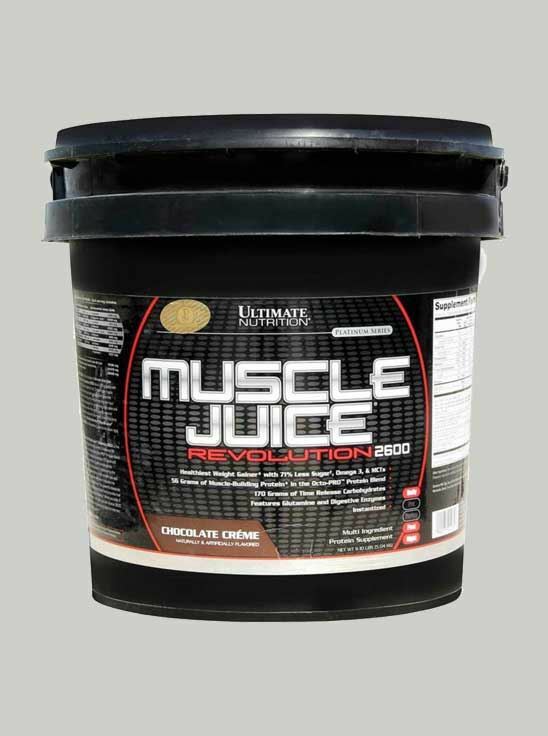 Ultimate Nutrition Muscle Juice Revolution 2600 4.69 lb Chocolate Creme features 56 grams of protein. It comes packed with 170 grams of time release carbohydrates to help digestion time and minimise bloating. In addition to the glutamine precursors, each serving (1000mg) of glutamine includes L-alanyl-L-glutamine. This powerful dipeptide may help to protect against muscle degradation and provide fuel for your intense exercise sessions. Deliberately developed to build muscle size, elevate energy levels, gain excess weight, and improve overall performance, this meal supplement helps achieve your fitness goals by supplying timely release of desired nourishment. It also assures an enriched source of carbohydrates since it feeds the muscles with glycogen to increase exercise ability and perform better in workouts. It induces more muscle pump to undergo strenuous fitness regimen with ease and assists in the secretion of hormones, namely insulin, to gain more lean muscles. Cocoa, Sodium Chloride, Sucralose, Acesulfame Potassium, Soy Lecithin and Natural and Artificial Flavours. 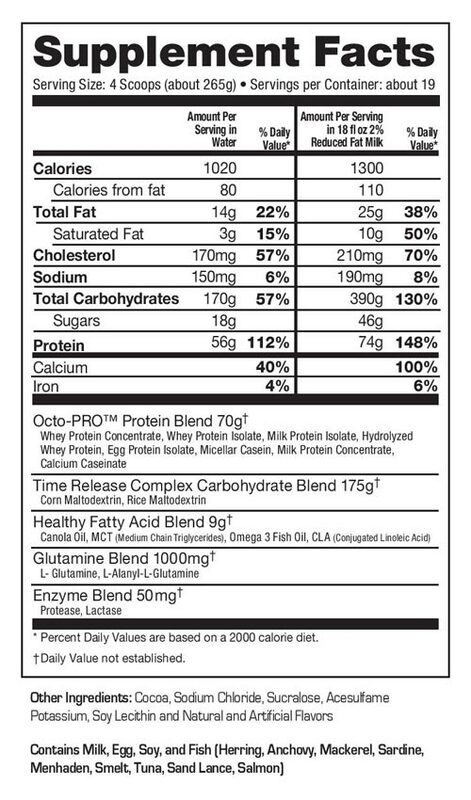 Contains Milk, Egg, Soy, and Fish (Herring, Anchovy, Mackerel, Sardine, Menhaden, Smelt, Tuna, Sand Lance, Salmon). Mix four scoops of Ultimate Nutrition Muscle Juice Revolution 2600 4.69 lb Chocolate Creme (about 265 grams) with 18 fl oz (532 ml) of water or milk. To maximise muscle gains and enhance your exercise program, take one serving in the morning, and a second serving one hour after your training session. On non-training days, take one serving between meals in the morning and a second serving between meals in the afternoon. Due to the time release nature of Ultimate Nutrition Muscle Juice Revolution 2600, it is the perfect gainer to be taken right before bed. 1.What are the nutritional benefits of canola? Canola is recognized for its nutritional attributes as it contains the lowest level of saturated fatty acids of any vegetable oil. It is high in monounsaturated fatty acids, which have been shown to reduce blood cholesterol levels, and has moderate amounts of essential polyunsaturated fatty acids. Like all vegetable oils, canola oil is cholesterol-free. Nutritional research is confirming that the fatty profile of canola oil appears to be beneficial in preventing and treating coronary heart disease risk factors including high blood cholesterol and lipid levels as well as thrombosis. 2. Why is there an Enzyme Blend? Enzymes promote absorption and assimilation. The importance of digestive enzymes resides in the fact that the human body cannot absorb nutrients in food unless digestive enzymes break them down. This ensures that we get the greatest possible nutritional value from foods.